For the last couple of weekends I’ve managed to divide my time between some of my favourite people. The weather’s continued to be amazing (this weekend not so much but I was a little glad of the respite from the heat!!) and I feel like I’ve managed to get so much done. As some of you will be (more than) aware, I’m organising a meet up for Northern bloggers next month so I’ve been preoccupied with planning and spreadsheets. I finally got the invites out and yesterday and have had an overwhelming response! I can’t wait to meet everyone and I just wish I had a bigger space to accommodate more… At least I’ll know for next time! With everything that’s going on at the moment, I feel like I’ve not had 5 minutes to myself. The new Boost juice bar opened in town last month and I’ve been itching to visit, so last weekend I grabbed Justine to try it out with me. After an agonising choice and a panic order (I have no idea why I have such issues about making decisions)I opted for the delicious Tropical Crush, a fruit crush made with mango, banana, tropical juice, sorbet and ice. 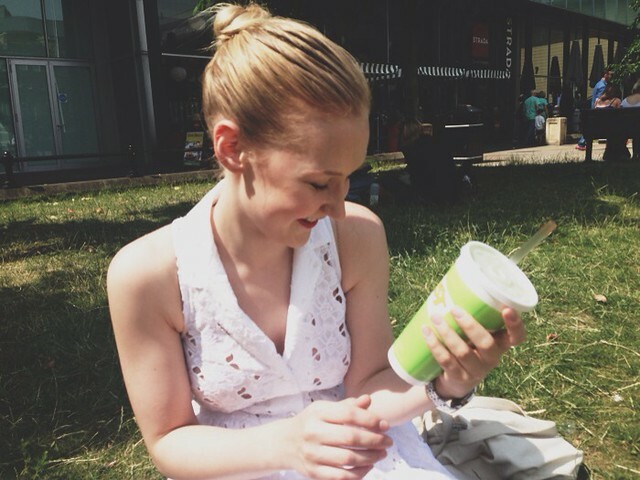 While Justine chose a much healthier green juice, which now I’m looking on the site for, I can’t actually find. Filled with fresh fruit and goodness but at £4something a pop, they’re not the cheapest way to get a health kick. The staff seemed nice and while we were waiting we had a little try of Banana Buzz, a low fat smoothie made from banana, honey, no fat milk, low fat soy, vanilla yoghurt and ice! And tonight when I nipped in to see the lovely folks at Lush about some goodies for my event, I decided to stop by and treat myself to one. Definitely worth a visit, if you can suffer the pretty high price tag! You look like you're having a great time and how did I miss those green sandals – I love! 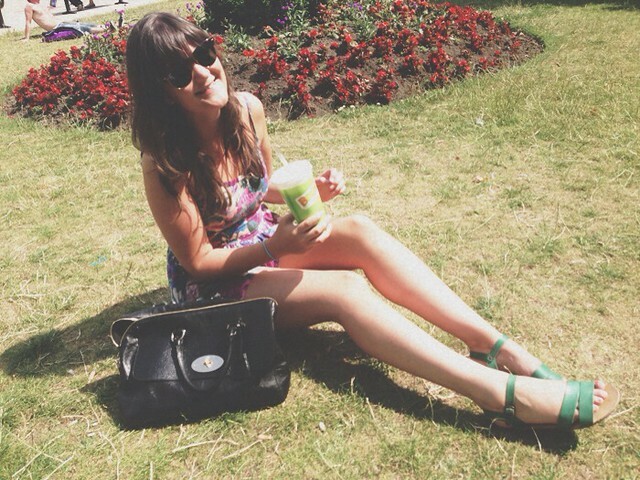 £4 a pop for a juice is a little pricey – I talked myself out of a £3 cinammon pretzel this week. Just thinking of my waistline. thanks, Sue! They're actually a couple of seasons old now and slightly wrecked since one of the buckles got too hot and became misshaped while I was away in Mykonos! Yeah I thought they were quite a lot but then I buy Innocent smoothies which are usually about £2 a pop and these were a lot bigger.. so maybe they are worth the price tag? Oh wow, I can just imagine how much work it is to organize a bloggers meet up especially on a larger scale. Good on you for doing this. You've just reminded me to start juicing and making smoothies again. It's been a while since I bothered. Ha I know, I'm not sure what I was thinking when I let myself in for it! I've got around 50 bloggers so it's not a huge scale but now all I can think is that I'm going to be disappointing people who didn't get in there quick enough for an invite!! And of course stressing about goody bags… As if I didn't have enough to be getting on with right now!